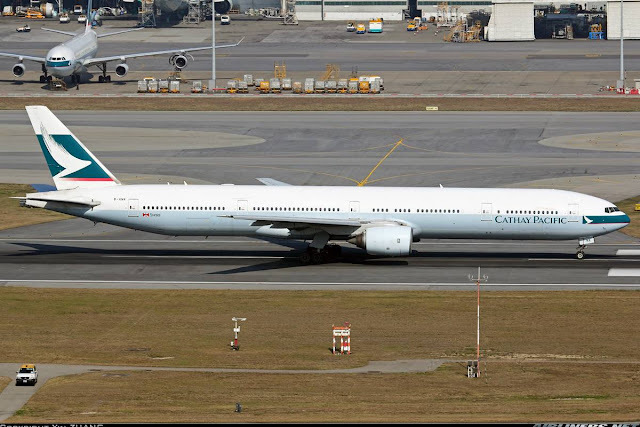 Welcome to my trip report on Cathay Pacific! As some of you know know that Cathay Pacific is well known for making last minute equipment changes, I was asking myself. Why didn't that happen to my flight! I was hoping for my aircraft to be changed to either Boeing 747-400 or Boeing 777-300ER! Why, you may ask? Because I have flown on CX's 773 before and that was B-HNJ when the airline used to fly to CGK from Singapore on the 5th freedom route. I paid S$281 for my CX return ticket to Hong Kong and I had very few fights to choose from, no complaints. CX711 offered the best timing, so choosing flight was an easy decision. The other flight to choose was CX650 which departed an hour early, also operated by 773. Just 2 days before departure, I did my on-line check in. Another friend of mine who had the Marco Polo membership was going to try his luck again. He went to Hong Kong on a 77W and got himself upgraded to Premium Economy, checking in at the counter so he hoped to try his luck again. My friends and I departure from our hotel at Nathan Road at around noon time, we took the Airport bus, A21 to the airport. At first, an old Dennis Trident bus came, my friend who is also a bus enthusiast persuaded us to skip it and wait for the next one. The next one came and it was the Dennis Enviro 500 (a newer model), we boarded that bus instead. Corona and Pizza - Perfect Combination. Photos taken at Victoria Peak. Dinner at Din Tai Feng! Its similar to Singapore's, slightly cheaper. My favourite dessert stall at Yee Shun Dairy Company. There are 4 branches, I went to the one at Yau Ma Tei. Breakfast at my favourite breakfast restaurant - Australia Dairy Company Located very near to Jordon MTR Station. The famous egg tart at Tai Cheong Bakery - Its quite nice! The famous Lau Hui Shan's dessert shop - Highly recommended. Does the food make you hungry? The interior of Dennis Enviro 500 - Cost about S$6 per ride, but it was worth it. The journey took around an hour to get to the airport. Once we reached there, we proceeded to do our check-in. There was a long queue at the check-in counters, so a few CX staff came and directed us to another queue, a bit messy but at least when I went there, there were only a few checking in. The check-in counter lady wasn't the most friendly out there but she was still professional. She asked me whether I wanted to go on the earlier flight, CX635 and she claimed that both flights (CX711) were operated by Airbus A330! I was like what!? Took a few seconds to think about it, my other 3 friends told me they were on the earlier flight, but I had decided, I was still going for it anyway. After all she also mentioned that my flight was full so perhaps 744 might be a possibility? So I stick to CX711. After that, went to meet them before we went to the air side together. Got my boarding pass, I was expecting myself to be just sitting a few rows in front of the wing. In September 2014, I would be flying with this airline. Hopefully on the 787 Dreamliner. I wouldn't mind flying this A340 to Singapore. It was heading to Taipei. There it was, my aircraft: B-HNK. Luckily, it was a new registration for me. My first sight of EVA Air's A321 in Star Alliance scheme. Once I was done with spotting, I made my way to a cafe to grab a bite. Just checking to make sure my flight was not delayed. Had my favourite barbaque pork bun and Milk Tea for lunch. This was my gate. I prefer this kind of open-space gate to the holding room (like Changi Airport), you can still roam around, take some photos while waiting for your flight, just as long as you keep track of the time. My friends were on board CX635, B-HNN. It would have been a new registration for me if I had chosen it. Looks like both of our flights were operated by Boeing 777-300, not Airbus A330-300 as claimed by the check-in staff. Hmm, following behind their flight was an American's Boeing 777, I wonder where it was going. The Boeing 777-300 have all been refurbished, so this ride would be a different experience from the one I took last time. What's the difference? Newer seats and IFE System. Usual boarding procedure commerced and I was already in a queue (perhaps 100 metres away from the counter), everything was in order. Saying goodbye to Hong Kong for now and my trip was almost coming to an end. Time certainly flies especially on a holiday. Once on board, I got to my seat, the seats are similar to CX's A330-300, B-HLO. The difference is the layout is different. This is a 3-3-3 seating configuration in the Y class of the 777, unlike the A330 which is 2-4-2. Here are some photos of the cabin! J class seats: Not impressed. Like I have mentioned in my earlier CX trip report, it feels more like flying on a Premium economy class. Of course it can't match with some of the newest IFE systems. USB port is noticeably missing. Legroom space is reasonable. I had 2 Asian passengers sitting beside me, it wasn't too bad for all of us. Flight ended up very full, I might have been better off on the earlier flight. I guess there were some passengers heading to Colombo and some joining this flight from Singapore. Meal service: Drink was served first. Plus a packet of peanuts! Not a fan of nuts, perhaps airlines should consider an option for snacks. Cake perhaps would be nice! I chose the chicken meal and it was quite tasty! I finished this up quite fast in fact. Top up with a nice cup of ice-cream! Once the meal service was done, it was time to relax and enjoy some movies. The in-flight service was good, had another good set of crew serving and smiling at every passengers. That's how service should be like. 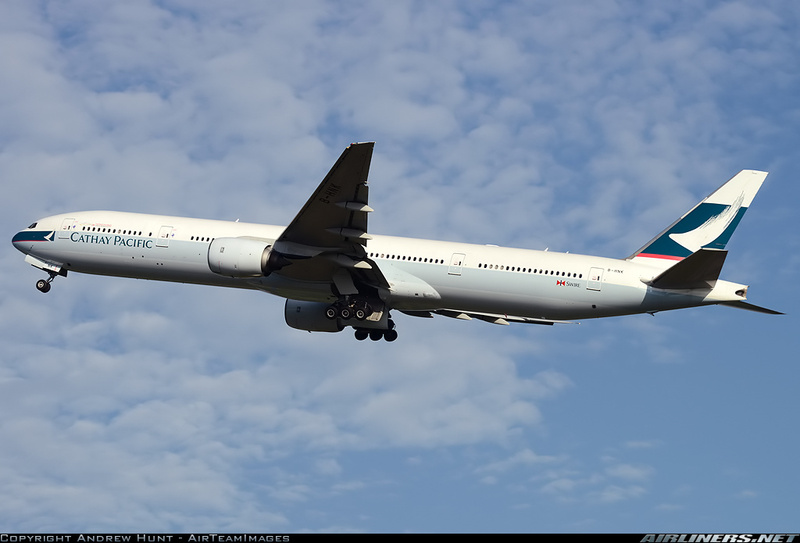 There are lots of comparison between Cathay Pacific and Singapore Airlines in terms of in-flight product and service. I feel that SQ has the better hardware, but in terms of service, I prefer Cathay Pacific. I feel its all down to your luck, the set of crew that you get plays a role. Sitting at the right seat allows me to take view of the airport. Sorry for the poor quality. Here are some window-shot photos. Almost there, runway 25 Left. Reverse thrust is deployed to slow the aircraft down. And here it is, my holiday has come to an end. 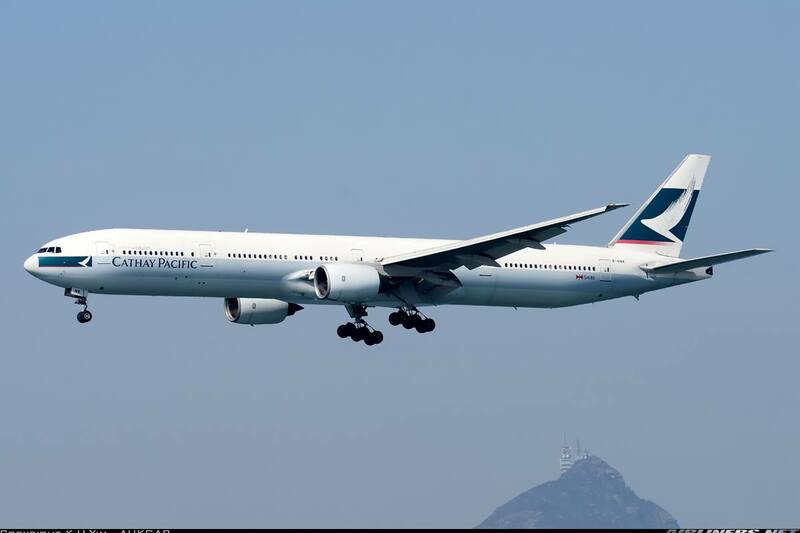 Both of my flights with Cathay Pacific were pleasant. Service was what you expect from one of the top airlines in the world. The crew I had on this flight wasn't as good as my previous CX flight, but still its good enough for me. I think the airline needs to address common product on its fleet. Doing last minute equipment change may not make some passengers happy. There are cases of passengers getting bump to a lower class (From Premium Economy to Economy class for example) due to an equipment change to a non-PE configured aircraft. Just like Thai Airways, equipment change happens so often that the airline might as well list the certain flights as EQV (Equipment Varies). Anyway, at this time, the airline is still refurbishing some aircraft to the newer products so if you get an old cabin, you are unfortunate! For reliability, you can trust this airline, for sure. It's one of the top airlines in Oneworld alliance and with its massive network, you will be taken good care by the airline. Thanks for reading this trip report.